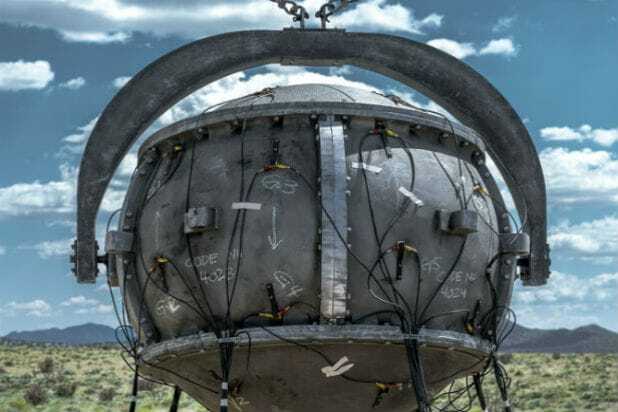 The Season 2 finale of WGN America’s “Manhattan” has been building to a moment viewers first saw teased in the first episode of the season: the test detonation of the first atomic bomb. “It’s the biggest ticking time bomb in the history of mankind,” series creator Sam Shaw told TheWrap. In the first episode of the season, viewers saw Jim Meeks (Christopher Denham) ascend the test tower to do final preparations on The Gagdet. But over the course of the season, fans have seen Meeks become party to incredibly dangerous activities as he spies on the project for the Soviets. Charlie Isaacs (Ashley Zukerman) has also undergone profound changes this season, recently suggesting that the bomb be dropped on a civilian target to maximize collateral damage. Executive producer Thomas Schlamme says that while Charlie is not the most lovable character, he hopes fans will at least understand him. Schlamme also said that Frank Winter (John Benjamin Hickey) has been the “mouthpiece” to help convey the gravity of the events depicted in the series. The Season 2 finale of “Manhattan” airs on WGN America Dec. 15 at 9 p.m./8c.